When Supreme Court Justice Tom Clark resigned his seat on the bench at the youthful age of 67 after 18 years, his decision was unique in the annals of Court history: he was leaving so that his son Ramsey, just nominated as Attorney General, could assume the job Clark himself had once held without conflict of interest. 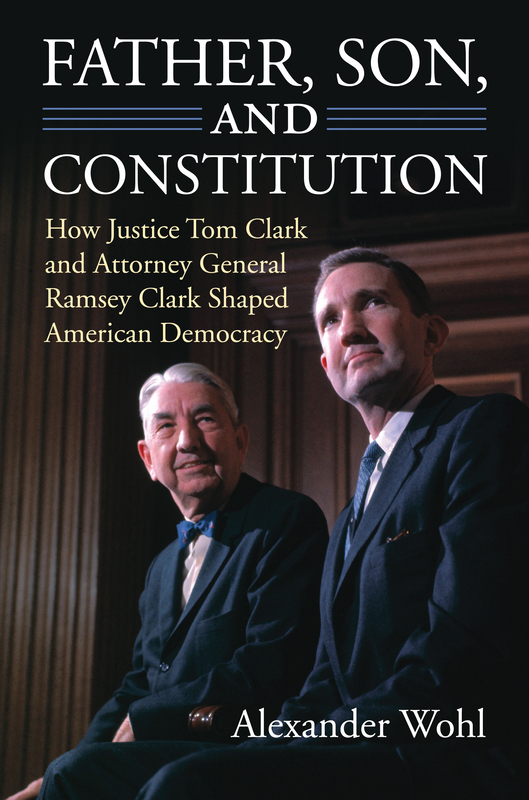 As Alexander Wohl shows, Tom and Ramsey Clark had a profound impact on American law and society. For nearly three quarters of a century, they influenced presidents, policies, and legal rulings, during careers that tracked closely with some of the most significant and controversial episodes in modern American history. Highlighting their consistent effort to balance individual liberties with government power, Wohl examines how their work reflected the tensions that continue to resonate in today's legal and policy battles. The two men, however, evolved quite differently. As a young government lawyer, Tom Clark was a key figure in enforcing the relocation of Japanese Americans, and as Attorney General he was vilified by civil liberties advocates for the Cold War policies he implemented, even as he promoted a progressive strategy on civil rights. Ramsey began his career to the ideological left of his father, was intimately involved in enforcement of civil rights laws during the turbulent 1960s, as Attorney General fought to expand protections of individual rights, and as a private attorney represented clients on the farthest reaches of the individual rights-government power spectrum. A unique approach for understanding our nation's history during the second half of the twentieth-century, Wohl's study addresses such salient issues as civil rights, free speech, government surveillance and rights of privacy, presidential power, and the role of judges in interpreting the Constitution. The Clarks' lives and careers also offer a veritable who's who of 20th-century American law and policy: from Tom's close relationships with Harry Truman, Lyndon Johnson, Sam Rayburn, and Earl Warren, to Ramsey's connections with Robert Kennedy, LBJ, and Martin Luther King Jr. Both men befriended and battled J. Edgar Hoover and both were targets of political attack—twenty years apart—by Richard Nixon. At its fundamental core, however, Wohl's book presents a moving and intimate portrait of a unique father-son relationship that endured through triumph and tribulation and that should appeal to anyone interested in how the personal and the political intertwine in a highly public setting. Alexander Wohl, a former Supreme Court Judicial Fellow and Supreme Court correspondent for the San Francisco Chronicle, is an adjunct professor at American University's Washington College of Law.